I remember a few #! forum members who have Raspberry, Banana, and/or Beagle devices said they would be interested in building something akin to BunsenLabs using a Debian ARM base. Does anyone have any progress to report? What I ran into with the rPI is that it has a proprietary broadcom blob that is needed to boot it up. I could likely work around that and build something up. However, anything I were to build would likely have to be rPi only as I believe Banana and Beagle devices don't come with that limitation. You can of course choose freely from the huge number of development boards out there; besides proprietary ones there are open-source solutions available, for example the beagleboard. Yeah. I wasn't aware of that little gotcha when I purchased the PI. I will look into it. I wasn't aware of the Broadcom issue with the Raspberry Pi either; this isn't something I've read about before. It's still not as bad as the "gotcha" I got when trying to find a way to purge Android from my generic fondleslab (apparently it's firmware and cannot be removed or bypassed). I think my next major purchase will be either a Banana Pi or Beagle Bone with a little 5" or 7" screen (they apparently have 5" screens up to 800x480 now) to use as a seedbox, then maybe a second one to replace my energy-hog desktop PC as my main computer. It vexes me that what I sunk into my desktop could have gone into building a decent ARM parallel cluster...water over/under the bridge...bygones. What are the specifications of the BunsenLabs? And what are its applications? Also how the ARM interfaced into it? Does the firmware is same for it as the ARM? Also what type of interfaces it has? Can (Debian for Arm) be installed in your generic slab? Could the bunsen netinstall work on top of the new jessie based raspian? ^ Don't see why it couldn't. @ostrolek: Not on bare metal, as I said in the post you quoted. I'm sure one of the rooted device options might work, but I'm about as interested in that as I am in VM installs. (I have zero interest.) If it isn't on bare metal, it isn't a true installation. Actually this would work I believe and get me around their custom built binary that bootstraps the system. I will test it when I get back home and let you know how it goes. I am not sure why I never thought of that. Just a note, this would have to be based on the netinstall. live-build in jessie only supports i686/586 and amd64. ^ Is it poss to modify the script to make it platform-agnostic? @manuti: Is the LXDE desktop installable in Raspbian? (I can't imagine why it wouldn't be.) If it is, then you may be able to simply wget the Openbox menus and BunsenLabs configs. I haven't even made any headway with UEFI. The netinstall script you mean, or hhh's iso-building? 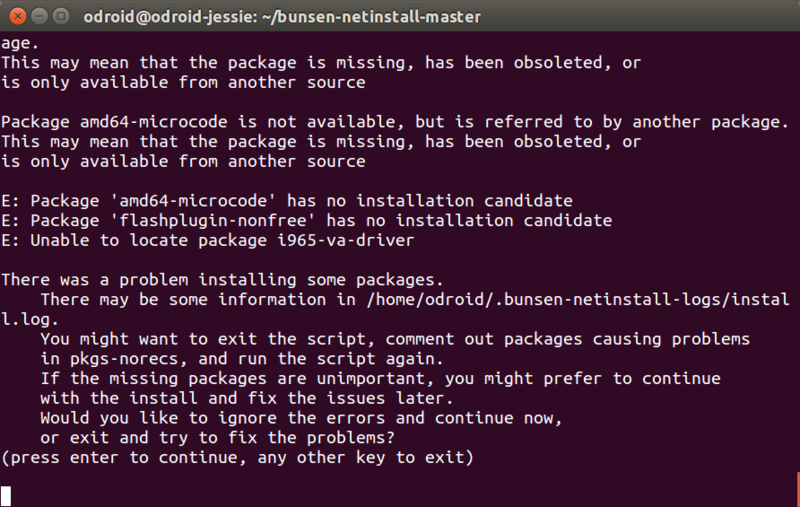 If the former, it is somewhat platform-agnostic, but as manuti found, there seems to be an issue with the Bunsen package repo when installing on arm. The installed packages themselves are all 'Architecture all', but there are a couple in the 'bunsen-hydrogen' repo which are only amd64 or i386. That might be the problem? ^ Could be; I'd forgotten we have a couple packages that you guys had to backport because they aren't available in Jessie (or the package in Jessie has problems, like xfce4-power-manager) and we couldn't find acceptable substitutes. I find this interesting and today cross-compiled a few packages for armhf (=ARMv7 with VFPv3) -- it just werks(TM), the extra work is basically NIL; just an additional pbuilder command. The only drawback is that compilation of anything ARM is very SLOW due to emulation (only binary packages need to be specificially rebuilt for ARM, but still). So I've created a armhf distro on the repository which contains all architecture-independent BL packages plus yad (upcoming dependency). Funnily, building my own forecast(1) program fails due to troubles with ncursesw5 but I had planned to move it into jessie-backports anyway, so no harm. I've also built compton & dfc in the jessie-backports repo for armhf, meaning that BL could be added to a ARM-based Debian system just via apt (most parts) Could somebody test if the binary packages work (I don't own any ARM platform (Android phones do not count))? If all works well, I could add the arm64 and armel archs too as well as the rest of the packages for armhf (if there's no trouble waiting to be discovered). Edit: Also built xfce4-power-manager:armhf. But that's it for today. ^ OMG, that is so awesome! I was resigned to accepting that, for Jessie/Hydrogen anyway, any attempt to make an ARM version would have to involve some package omissions or substitutions due to availability. Had no idea that cross-arch compilation was so painless (excepting the computer time), or that you would jump right on this. You are so awesome! Ohhh this is awesome, I give it a try this weekend. I have a lot of ARM boards and I want a lightweight desktop. Maybe I try on Odroid and Raspberry Pi boards. I have also a BananaPRO but is in production and I don't want to do experiments on it. Blunt I am. Arm and gui spell wayland to me. From what I have heard - Openbox is not easily ported to wayland, however xfwm4 is. Working up a #!-Bunsen for arm seems a wast of time to me. My future hopefully includes QT5 and wayland and probably xfwm4. ^ I understand the future of LXDE is LXQT anyway; it wouldn't surprise me if that ends up being the default GUI for BunsenLabs Helium and/or Lithium. From what I have heard - Openbox is not easily ported to wayland, however xfwm4 is. Where did you hear that? It's likely going to be equally difficult.